Citation Information: J Clin Invest. 2006;116(4):843-843. https://doi.org/10.1172/JCI120032. Citation Information: J Clin Invest. 2006;116(4):844-844. https://doi.org/10.1172/JCI28364. Citation Information: J Clin Invest. 2006;116(4):845-845. https://doi.org/10.1172/JCI28378. Citation Information: J Clin Invest. 2006;116(4):846-846. https://doi.org/10.1172/JCI28377. Citation Information: J Clin Invest. 2006;116(4):847-852. https://doi.org/10.1172/JCI28271. The urgent need for better cancer treatments has stimulated interest in employing small-animal models to evaluate potential drug therapies. Robust mouse models of many human cancers have been generated using sophisticated technologies for engineering germ-line mutations. As we enter into an age of targeted therapeutics, these strains provide novel platforms for validating new anticancer drugs, assessing therapeutic index, identifying surrogate markers of tumor progression, and defining epigenetic and environmental influences on tumorigenesis. Citation Information: J Clin Invest. 2006;116(4):853-857. https://doi.org/10.1172/JCI28232. The long history of lead poisoning provides many lessons about the process by which scientific knowledge is translated into public health policy. In the United States, lead was added to paint and to gasoline in enormous quantities long after medical evidence clearly showed that excessive lead exposure caused considerable morbidity in the population. This article discusses some of the factors that contributed to the slow pace of efforts to address this problem, including the ubiquity and magnitude of lead exposure during much of the twentieth century, which produced a distorted notion about the blood lead level that can be considered “normal”; the prevailing model of disease during this period, notably the novelty of the concept of subclinical disease; the fact that childhood lead poisoning affected mostly families that were politically and economically disenfranchised, fostering a “blame the victim” attitude; and that controlling lead exposure would have impeded efforts to achieve other desirable goals, illustrating the role that value trade-offs often play in policy decisions. Citation Information: J Clin Invest. 2006;116(4):858-860. https://doi.org/10.1172/JCI28140. Human T cell leukemia virus type 1 (HTLV-1) is the etiologic agent for the development of an aggressive hematologic neoplasia termed adult T cell leukemia/lymphoma (ATLL). Although the virus infects T cell subsets that display either CD4 or CD8 cell surface markers, the leukemic cell is exclusively of the CD4+ subtype. In the article by Sibon et al. in this issue of the JCI, the authors demonstrate that the molecular basis for clonal expansion differs between these 2 infected T cell populations (see the related article beginning on page 974). The molecular events associated with a preleukemic state, such as genomic instability, polynucleation, and cell cycle redistribution, were only observed in CD4+ T cells. This finding provides a molecular-based mechanism for the restriction of the leukemic phenotype to the CD4+ T cell subtype. Citation Information: J Clin Invest. 2006;116(4):860-863. https://doi.org/10.1172/JCI28111. Sepsis and sepsis syndrome are leading causes of mortality throughout the world. It is widely held that sepsis represents a dysregulated innate immune response to an offending pathogen. This immune response is often initiated via microbial products signaling through TLRs expressed on host immune cells. There is increasing evidence that this innate response can be dramatically influenced by the cellular redox state, and thus a better understanding of oxidative regulation of innate immunity could lead to new treatments for sepsis. In this issue of the JCI, Thimmulappa et al. show that nuclear factor-erythroid 2–related factor 2 (Nrf2), a member of the “cap’n’collar” family of basic region–leucine zipper transcription factors, which has previously been shown to be involved in the transcription of antioxidant gene expression in response to xenobiotic stress, is also a critical regulator of cellular oxidative stress in sepsis (see the related article beginning on page 984). Citation Information: J Clin Invest. 2006;116(4):863-866. https://doi.org/10.1172/JCI28320. During vertebrate development, mesenchymal progenitors capable of forming bone, cartilage, muscle, fat, or tendon arise from either neural crest or somitic mesoderm. Transcriptional programs that specify mesenchymal cell fates are initiated and modified by paracrine cues provided by TGF-β superfamily members and mediated in part via the regulated assembly of Smad-containing multiprotein transcription factor complexes. In this issue of the JCI, Hoffmann and colleagues have identified that Smad8 activation drives tendon formation from C3H10T1/2 cells, a murine cell line that recapitulates many features of normal multipotent mesenchymal cells (see the related article beginning on page 940). Cells programmed to the tenocyte cell fate in vitro formed tenogenic grafts in vivo. These results add to the accumulating evidence that proliferating, multipotent mesenchymal progenitor cells can be programmed to yield multiple cell types — e.g., osteoblasts, myocytes, chondrocytes, and tenocytes — that may be useful in cell-based therapeutic approaches to musculoskeletal diseases. Citation Information: J Clin Invest. 2006;116(4):866-869. https://doi.org/10.1172/JCI28312. The aspartyl protease renin was first isolated from the kidney by Tigerstedt more than a century ago. In the kidney, renin secretion is tightly linked to sodium intake and renal perfusion pressure, reflecting the important role of the renin-angiotensin system (RAS) in controlling body fluid volume and blood pressure. The study by Mackins et al. in this issue of the JCI describes a novel source of renin: the mast cell (see the related article beginning on page 1063). This discovery suggests a distinct pathway for activation of the RAS that may have a particular impact on the pathogenesis of chronic tissue injury as well as more acute pathology such as arrhythmias in the heart. Pathomechanisms in rheumatoid arthritis — time for a string theory? Citation Information: J Clin Invest. 2006;116(4):869-871. https://doi.org/10.1172/JCI28300. RA is a quintessential autoimmune disease with a growing number of cells, mediators, and pathways implicated in this tissue-injurious inflammation. Now Kuhn and colleagues have provided convincing evidence that autoantibodies reacting with citrullinated proteins, known for their sensitivity and specificity as biomarkers in RA, enhance tissue damage in collagen-induced arthritis (see the related article beginning on page 961). This study adds yet another soldier to the growing army of autoaggressive mechanisms that underlie RA. With great success researchers have dismantled the pathogenic subunits of RA, adding gene to gene, molecule to molecule, and pathway to pathway in an ever more complex scheme of dysfunction. The complexity of the emerging disease model leaves us speechless. It seems that with this wealth of data available, we need to develop a new theory for this disease. We may want to seek guidance from our colleagues in physics and mathematics who have successfully integrated their knowledge of elementary particles and the complexity of their interacting forces by formulating the string theory. Citation Information: J Clin Invest. 2006;116(4):872-874. https://doi.org/10.1172/JCI28296. Male and female external genitalia appear identical early in gestation. Testosterone exposure at 8–12 weeks’ gestation causes male differentiation. Female fetuses virilize if their adrenals secrete excessive levels of androgens, as occurs in congenital adrenal hyperplasia due to 21-hydroxylase deficiency. This can be ameliorated by administering dexamethasone to the mother. A study by Goto et al. in this issue of the JCI provides a rationale for this treatment by demonstrating that the fetal hypothalamic-pituitary-adrenal axis is fully functional when the genitalia differentiate (see the related article beginning on page 953). Dexamethasone suppresses this axis, reducing abnormal secretion of adrenal androgens. Their results also show that cortisol synthesis by the fetal adrenal decreases after this period, allowing the adrenal to secrete high levels of dehydroepiandrosterone, an androgen precursor. However, this does not virilize female fetuses because androgens are aromatized to estrogens in the placenta. Thus normal sexual differentiation requires exquisite timing of fetal cortisol and androgen secretion versus placental capacity for aromatization. Citation Information: J Clin Invest. 2006;116(4):875-877. https://doi.org/10.1172/JCI28234. Enhanced signaling in myocytes by the G protein Gq has been implicated in cardiac hypertrophy and the transition to heart failure. α1-Adrenergic receptors (α1-ARs) are members of the 7-transmembrane-spanning domain (7-TM) receptor family and signal via interaction with Gq in the heart. The specific effects of a loss of α1-AR signaling in the heart are explored by O’Connell et al. 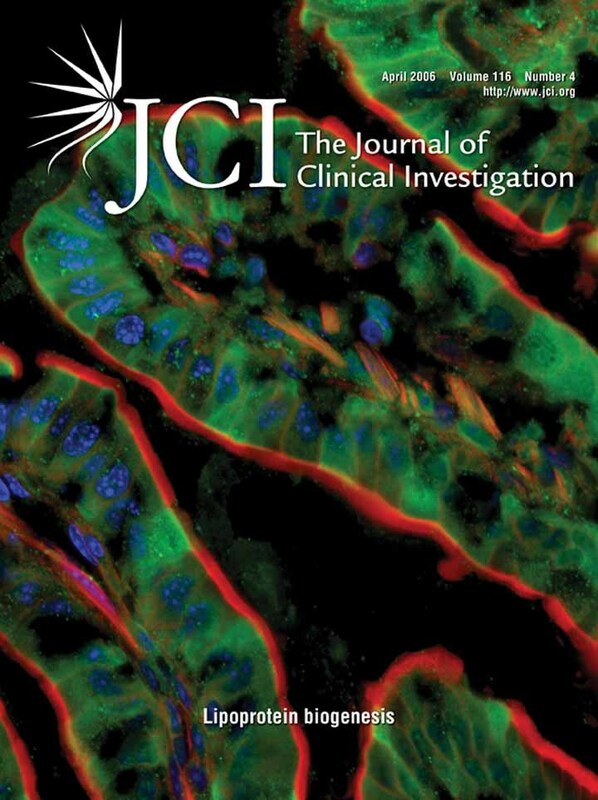 in this issue of the JCI (see the related article beginning on page 1005). Paradoxically, gene ablation of the α1A and α1B subtypes in mice results in a maladaptive form of reactive cardiac hypertrophy from pressure overload, with a predisposition to heart failure. Thus signaling to the α1-AR (compared with signaling from other receptors such as angiotensin receptors, which also couple to Gq) appears to be specifically required for a normal hypertrophic response. This represents another example of how receptors that share common G proteins have diversified, developing unique signaling programs. These findings may have particular clinical relevance because of the widespread use of α1-AR antagonists in the treatment of hypertension and symptomatic prostate enlargement. Citation Information: J Clin Invest. 2006;116(4):878-891. https://doi.org/10.1172/JCI26323. Claudin-16 (Cldn16) is selectively expressed at tight junctions (TJs) of renal epithelial cells of the thick ascending limb of Henle’s loop, where it plays a central role in the reabsorption of divalent cations. Over 20 different mutations in the CLDN16 gene have been identified in patients with familial hypomagnesemia with hypercalciuria and nephrocalcinosis (FHHNC), a disease of excessive renal Mg2+ and Ca2+ excretion. Here we show that disease-causing mutations can lead to the intracellular retention of Cldn16 or affect its capacity to facilitate paracellular Mg2+ transport. Nine of the 21 Cldn16 mutants we characterized were retained in the endoplasmic reticulum, where they underwent proteasomal degradation. Three mutants accumulated in the Golgi complex. Two mutants were efficiently delivered to lysosomes, one via clathrin-mediated endocytosis following transport to the cell surface and the other without appearing on the plasma membrane. The remaining 7 mutants localized to TJs, and 4 were found to be defective in paracellular Mg2+ transport. We demonstrate that pharmacological chaperones rescued surface expression of several retained Cldn16 mutants. We conclude that FHHNC can result from mutations in Cldn16 that affect intracellular trafficking or paracellular Mg2+ permeability. Knowledge of the molecular defects associated with disease-causing Cldn16 mutations may open new venues for therapeutic intervention. Citation Information: J Clin Invest. 2006;116(4):892-904. https://doi.org/10.1172/JCI25901. Vitamin D receptor (VDR) ligands are therapeutic agents for the treatment of psoriasis, osteoporosis, and secondary hyperparathyroidism. VDR ligands also show immense potential as therapeutic agents for autoimmune diseases and cancers of skin, prostate, colon, and breast as well as leukemia. However, the major side effect of VDR ligands that limits their expanded use and clinical development is hypercalcemia that develops as a result of the action of these compounds mainly on intestine. In order to discover VDR ligands with less hypercalcemia liability, we sought to identify tissue-selective VDR modulators (VDRMs) that act as agonists in some cell types and lack activity in others. Here, we describe LY2108491 and LY2109866 as nonsecosteroidal VDRMs that function as potent agonists in keratinocytes, osteoblasts, and peripheral blood mononuclear cells but show poor activity in intestinal cells. Finally, these nonsecosteroidal VDRMs were less calcemic in vivo, and LY2108491 exhibited more than 270-fold improved therapeutic index over the naturally occurring VDR ligand 1,25-dihydroxyvitamin D3 [1,25-(OH)2D3] in an in vivo preclinical surrogate model of psoriasis. Citation Information: J Clin Invest. 2006;116(4):905-915. https://doi.org/10.1172/JCI26836. The role of activated microglia (MG) in demyelinating neurodegenerative diseases such as multiple sclerosis is controversial. Here we show that high, but not low, levels of IFN-γ (a cytokine associated with inflammatory autoimmune diseases) conferred on rodent MG a phenotype that impeded oligodendrogenesis from adult neural stem/progenitor cells. IL-4 reversed the impediment, attenuated TNF-α production, and overcame blockage of IGF-I production caused by IFN-γ. In rodents with acute or chronic EAE, injection of IL-4–activated MG into the cerebrospinal fluid resulted in increased oligodendrogenesis in the spinal cord and improved clinical symptoms. The newly formed oligodendrocytes were spatially associated with MG expressing MHC class II proteins and IGF-I. These results point to what we believe to be a novel role for MG in oligodendrogenesis from the endogenous stem cell pool. Citation Information: J Clin Invest. 2006;116(4):916-928. https://doi.org/10.1172/JCI27203. Emerging evidence suggests critical roles for APCs in suppressing immune responses. Here, we show that zymosan, a stimulus for TLR2 and dectin-1, regulates cytokine secretion in DCs and macrophages to induce immunological tolerance. First, zymosan induces DCs to secrete abundant IL-10 but little IL-6 and IL-12(p70). Induction of IL-10 is dependent on TLR2- and dectin-1–mediated activation of ERK MAPK via a mechanism independent of the activation protein 1 (AP-1) transcription factor c-Fos. Such DCs stimulate antigen-specific CD4+ T cells poorly due to IL-10 and the lack of IL-6. Second, zymosan induces F4-80+ macrophages in the splenic red pulp to secrete TGF-β. Consistent with these effects on APCs, injection of zymosan plus OVA into mice results in OVA-specific T cells that secrete little or no Th1 or Th2 cytokines, but secrete robust levels of IL-10, and are unresponsive to challenge with OVA plus adjuvant. Finally, coinjection of zymosan with OVA plus LPS suppresses the response to OVA via a mechanism dependent on IL-10, TGF-β, and lack of IL-6. Together, our data demonstrate that zymosan stimulates IL-10+IL-12(p70)–IL-6low regulatory DCs and TGF-β+ macrophages to induce immunological tolerance. These data suggest several targets for pharmacological modulation of immune responses in various clinical settings. Citation Information: J Clin Invest. 2006;116(4):929-939. https://doi.org/10.1172/JCI27363. GATA transcription factors play critical roles in restricting cell lineage differentiation during development. Here, we show that conditional inactivation of GATA-6 in VSMCs results in perinatal mortality from a spectrum of cardiovascular defects, including interrupted aortic arch and persistent truncus arteriosus. Inactivation of GATA-6 in neural crest recapitulates these abnormalities, demonstrating a cell-autonomous requirement for GATA-6 in neural crest–derived SMCs. Surprisingly, the observed defects do not result from impaired SMC differentiation but rather are associated with severely attenuated expression of semaphorin 3C, a signaling molecule critical for both neuronal and vascular patterning. Thus, the primary function of GATA-6 during cardiovascular development is to regulate morphogenetic patterning of the cardiac outflow tract and aortic arch. These findings provide new insights into the conserved functions of the GATA-4, -5, and -6 subfamily members and identify GATA-6 and GATA-6–regulated genes as candidates involved in the pathogenesis of congenital heart disease. Citation Information: J Clin Invest. 2006;116(4):953-960. https://doi.org/10.1172/JCI25091. In humans, sexual differentiation of the external genitalia is established at 7–12 weeks post conception (wpc). During this period, maintaining the appropriate intrauterine hormone environment is critical. In contrast to other species, this regulation extends to the human fetal adrenal cortex, as evidenced by the virilization that is associated with various forms of congenital adrenal hyperplasia. The mechanism underlying these clinical findings has remained elusive. Here we show that the human fetal adrenal cortex synthesized cortisol much earlier than previously documented, an effect associated with transient expression of the orphan nuclear receptor nerve growth factor IB-like (NGFI-B) and its regulatory target, the steroidogenic enzyme type 2 3β-hydroxysteroid dehydrogenase (HSD3B2). This cortisol biosynthesis was maximal at 8–9 wpc under the regulation of ACTH. Negative feedback was apparent at the anterior pituitary corticotrophs. ACTH also stimulated the adrenal gland to secrete androstenedione and testosterone. In concert, these data promote a distinctive mechanism for normal human development whereby cortisol production, determined by transient NGFI-B and HSD3B2 expression, provides feedback at the anterior pituitary to modulate androgen biosynthesis and safeguard normal female sexual differentiation. Citation Information: J Clin Invest. 2006;116(4):961-973. https://doi.org/10.1172/JCI25422. Antibodies against citrullinated proteins are specific and predictive markers for rheumatoid arthritis although the pathologic relevance of these antibodies remains unclear. To investigate the significance of these autoantibodies, collagen-induced arthritis (CIA) in mice was used to establish an animal model of antibody reactivity to citrullinated proteins. DBA/1J mice were immunized with bovine type II collagen (CII) at days 0 and 21, and serum was collected every 7 days for analysis. Antibodies against both CII and cyclic citrullinated peptide, one such citrullinated antigen, appeared early after immunization, before joint swelling was observed. Further, these antibodies demonstrated specific binding to citrullinated filaggrin in rat esophagus by indirect immunofluorescence and citrullinated fibrinogen by Western blot. To evaluate the role of immune responses to citrullinated proteins in CIA, mice were tolerized with a citrulline-containing peptide, followed by antigen challenge with CII. Tolerized mice demonstrated significantly reduced disease severity and incidence compared with controls. We also identified novel murine monoclonal antibodies specific to citrullinated fibrinogen that enhanced arthritis when coadministered with a submaximal dose of anti-CII antibodies and bound targets within the inflamed synovium of mice with CIA. These results demonstrate that antibodies against citrullinated proteins are centrally involved in the pathogenesis of autoimmune arthritis. Citation Information: J Clin Invest. 2006;116(4):974-983. https://doi.org/10.1172/JCI27198. Human T cell leukemia virus type 1 (HTLV-1) infects both CD4+ and CD8+ lymphocytes, yet it induces adult T cell leukemia/lymphoma (ATLL) that is regularly of the CD4+ phenotype. Here we show that in vivo infected CD4+ and CD8+ T cells displayed similar patterns of clonal expansion in carriers without malignancy. Cloned infected cells from individuals without malignancy had a dramatic increase in spontaneous proliferation, which predominated in CD8+ lymphocytes and depended on the amount of tax mRNA. In fact, the clonal expansion of HTLV-1–positive CD8+ and CD4+ lymphocytes relied on 2 distinct mechanisms — infection prevented cell death in the former while recruiting the latter into the cell cycle. Cell cycling, but not apoptosis, depended on the level of viral-encoded tax expression. Infected tax-expressing CD4+ lymphocytes accumulated cellular defects characteristic of genetic instability. Therefore, HTLV-1 infection establishes a preleukemic phenotype that is restricted to CD4+ infected clones. Citation Information: J Clin Invest. 2006;116(4):984-995. https://doi.org/10.1172/JCI25790. Host genetic factors that regulate innate immunity determine susceptibility to sepsis. Disruption of nuclear factor-erythroid 2–related factor 2 (Nrf2), a basic leucine zipper transcription factor that regulates redox balance and stress response, dramatically increased the mortality of mice in response to endotoxin- and cecal ligation and puncture–induced septic shock. LPS as well as TNF-α stimulus resulted in greater lung inflammation in Nrf2-deficient mice. Temporal analysis of pulmonary global gene expression after LPS challenge revealed augmented expression of large numbers of proinflammatory genes associated with the innate immune response at as early as 30 minutes in lungs of Nrf2-deficient mice, indicating severe immune dysregulation. The expression profile indicated that Nrf2 has a global influence on both MyD88-dependent and -independent signaling. Nrf2-deficient mouse embryonic fibroblasts showed greater activation of NF-κB and interferon regulatory factor 3 in response to LPS and polyinosinic-polycytidylic acid [poly(I:C)] stimulus, corroborating the effect of Nrf2 on MyD88-dependent and -independent signaling. Nrf2’s regulation of cellular glutathione and other antioxidants is critical for optimal NF-κB activation in response to LPS and TNF-α. Our study reveals Nrf2 as a novel modifier gene of sepsis that determines survival by mounting an appropriate innate immune response. Citation Information: J Clin Invest. 2006;116(4):996-1004. https://doi.org/10.1172/JCI26490. Studies in humans and mice show an important role for Tregs in the control of immunological disorders. The mechanisms underlying the immunosuppressive functions of Tregs are not well understood. Here, we show that CD4+ T cells expressing Foxp3 and membrane-bound TGF-β (TGF-βm+Foxp3+), previously shown to be immunosuppressive in both allergic and autoimmune diseases, activate the Notch1–hairy and enhancer of split 1 (Notch1-HES1) axis in target cells. Soluble TGF-β and cells secreting similar levels of soluble TGF-β were unable to trigger Notch1 activation. Inhibition of Notch1 activation in vivo reversed the immunosuppressive functions of TGF-βm+Foxp3+ cells, resulting in severe allergic airway inflammation. Integration of the TGF-β and Notch1 pathways may be an important mechanism for the maintenance of immune homeostasis in the periphery. Citation Information: J Clin Invest. 2006;116(4):1005-1015. https://doi.org/10.1172/JCI22811. An α1-adrenergic receptor (α1-AR) antagonist increased heart failure in the Antihypertensive and Lipid-Lowering Treatment to Prevent Heart Attack Trial (ALLHAT), but it is unknown whether this adverse result was due to α1-AR inhibition or a nonspecific drug effect. We studied cardiac pressure overload in mice with double KO of the 2 main α1-AR subtypes in the heart, α1A (Adra1a) and α1B (Adra1b). At 2 weeks after transverse aortic constriction (TAC), KO mouse survival was only 60% of WT, and surviving KO mice had lower ejection fractions and larger end-diastolic volumes than WT mice. Mechanistically, final heart weight and myocyte cross-sectional area were the same after TAC in KO and WT mice. However, KO hearts after TAC had increased interstitial fibrosis, increased apoptosis, and failed induction of the fetal hypertrophic genes. Before TAC, isolated KO myocytes were more susceptible to apoptosis after oxidative and β-AR stimulation, and β-ARs were desensitized. Thus, α1-AR deletion worsens dilated cardiomyopathy after pressure overload, by multiple mechanisms, indicating that α1-signaling is required for cardiac adaptation. These results suggest that the adverse cardiac effects of α1-antagonists in clinical trials are due to loss of α1-signaling in myocytes, emphasizing concern about clinical use of α1-antagonists, and point to a revised perspective on sympathetic activation in heart failure. Citation Information: J Clin Invest. 2006;116(4):1016-1024. https://doi.org/10.1172/JCI21545. Muscle-specific kinase (MuSK) is critical for the synaptic clustering of nicotinic acetylcholine receptors (AChRs) and plays multiple roles in the organization and maintenance of neuromuscular junctions (NMJs). MuSK is activated by agrin, which is released from motoneurons, and induces AChR clustering at the postsynaptic membrane. Although autoantibodies against the ectodomain of MuSK have been found in a proportion of patients with generalized myasthenia gravis (MG), it is unclear whether MuSK autoantibodies are the causative agent of generalized MG. In the present study, rabbits immunized with MuSK ectodomain protein manifested MG-like muscle weakness with a reduction of AChR clustering at the NMJs. The autoantibodies activated MuSK and blocked AChR clustering induced by agrin or by mediators that do not activate MuSK. Thus MuSK autoantibodies rigorously inhibit AChR clustering mediated by multiple pathways, an outcome that broadens our general comprehension of the pathogenesis of MG.
Citation Information: J Clin Invest. 2006;116(4):1025-1036. https://doi.org/10.1172/JCI23792. The prevalence of asthma continues to increase. Asthma is caused by a Th2 cell–driven immune response. Its optimal treatment remains a challenge, and a sufficient immunotherapeutic approach to treating asthma has yet to be found. Using a murine asthma model, we show that a single injection of an anti-CD137 (4-1BB) mAb prevents the development of airway hyperreactivity, eosinophilic airway inflammation, excessive mucus production, and elevated IgE during the observation period of 7 weeks. Most importantly, even established disease is completely reversed by anti-CD137 mAb administration. The protection is associated with markedly reduced Th2 cytokine production and increased secretion of the Th1 cytokine IFN-γ. While B lymphocytes are partly depleted, the number of CD8+ T cells is increased. Blockade of IFN-γ and depletion of CD8+ T cells during treatment with anti-CD137 mAb reduces in part but does not abrogate the protective effect of CD137 mAb. In contrast, CD137 mAb–mediated CD4+ T cell anergy is critical for the observed effects, since transfer of CD4+ T cells from CD137 mAb–treated mice conveyed protection. These data demonstrate, for the first time to our knowledge, the capacity of anti-CD137 mAb to ameliorate allergic asthma, and they indicate CD137 as a possible target for therapeutic intervention in this disease. Citation Information: J Clin Invest. 2006;116(4):1037-1044. https://doi.org/10.1172/JCI25805. One approach to improving efficacy in MS therapy is to identify medications that provide additive or synergistic benefit in combination. Orally administered cholesterol-lowering HMG-CoA reductase inhibitors (known as statins), which exhibit immunomodulatory properties and are effective in treatment of the MS model EAE, are being tested in MS. As atorvastatin can enhance protective Th2 responses and has a different mechanism of action than glatiramer acetate (GA), a parenterally administered immunomodulatory agent approved for MS treatment, we tested whether the combination of these agents could be beneficial in EAE. Combination therapy using suboptimal doses of atorvastatin and GA prevented or reversed clinical and histologic EAE. Secretion of proinflammatory Th1 cytokines was reduced — and conversely Th2 cytokine secretion was increased — in these mice, but not in mice treated with each drug alone at the same doses. Monocytes treated with the combination of suboptimal doses of atorvastatin and GA secreted an antiinflammatory type II cytokine pattern and, when used as APCs, promoted Th2 differentiation of naive myelin-specific T cells. Our results demonstrate that agents with different mechanisms of immune modulation can combine in a synergistic manner for the treatment of CNS autoimmunity and provide rationale for testing the combination of atorvastatin and GA in MS.
Citation Information: J Clin Invest. 2006;116(4):1052-1062. https://doi.org/10.1172/JCI27352. Plasma HDL cholesterol levels are inversely related to risk for atherosclerosis. The ATP-binding cassette, subfamily A, member 1 (ABCA1) mediates the rate-controlling step in HDL particle formation, the assembly of free cholesterol and phospholipids with apoA-I. ABCA1 is expressed in many tissues; however, the physiological functions of ABCA1 in specific tissues and organs are still elusive. The liver is known to be the major source of plasma HDL, but it is likely that there are other important sites of HDL biogenesis. To assess the contribution of intestinal ABCA1 to plasma HDL levels in vivo, we generated mice that specifically lack ABCA1 in the intestine. Our results indicate that approximately 30% of the steady-state plasma HDL pool is contributed by intestinal ABCA1 in mice. In addition, our data suggest that HDL derived from intestinal ABCA1 is secreted directly into the circulation and that HDL in lymph is predominantly derived from the plasma compartment. These data establish a critical role for intestinal ABCA1 in plasma HDL biogenesis in vivo. Citation Information: J Clin Invest. 2006;116(4):1063-1070. https://doi.org/10.1172/JCI25713. Having identified renin in cardiac mast cells, we assessed whether its release leads to cardiac dysfunction. In Langendorff-perfused guinea pig hearts, mast cell degranulation with compound 48/80 released Ang I–forming activity. This activity was blocked by the selective renin inhibitor BILA2157, indicating that renin was responsible for Ang I formation. Local generation of cardiac Ang II from mast cell–derived renin also elicited norepinephrine release from isolated sympathetic nerve terminals. This action was mediated by Ang II-type 1 (AT1) receptors. In 2 models of ischemia/reperfusion using Langendorff-perfused guinea pig and mouse hearts, a significant coronary spillover of renin and norepinephrine was observed. In both models, this was accompanied by ventricular fibrillation. Mast cell stabilization with cromolyn or lodoxamide markedly reduced active renin overflow and attenuated both norepinephrine release and arrhythmias. Similar cardioprotection was observed in guinea pig hearts treated with BILA2157 or the AT1 receptor antagonist EXP3174. Renin overflow and arrhythmias in ischemia/reperfusion were much less prominent in hearts of mast cell–deficient mice than in control hearts. Thus, mast cell–derived renin is pivotal for activating a cardiac renin-angiotensin system leading to excessive norepinephrine release in ischemia/reperfusion. Mast cell–derived renin may be a useful therapeutic target for hyperadrenergic dysfunctions, such as arrhythmias, sudden cardiac death, myocardial ischemia, and congestive heart failure. Citation Information: J Clin Invest. 2006;116(4):1071-1080. https://doi.org/10.1172/JCI23354. Insulin resistance markedly increases cardiovascular disease risk in people with normal glucose tolerance, even after adjustment for known risk factors such as LDL, triglycerides, HDL, and systolic blood pressure. In this report, we show that increased oxidation of FFAs in aortic endothelial cells without added insulin causes increased production of superoxide by the mitochondrial electron transport chain. FFA-induced overproduction of superoxide activated a variety of proinflammatory signals previously implicated in hyperglycemia-induced vascular damage and inactivated 2 important antiatherogenic enzymes, prostacyclin synthase and eNOS. In 2 nondiabetic rodent models — insulin-resistant, obese Zucker (fa/fa) rats and high-fat diet–induced insulin-resistant mice — inactivation of prostacyclin synthase and eNOS was prevented by inhibition of FFA release from adipose tissue; by inhibition of the rate-limiting enzyme for fatty acid oxidation in mitochondria, carnitine palmitoyltransferase I; and by reduction of superoxide levels. These studies identify what we believe to be a novel mechanism contributing to the accelerated atherogenesis and increased cardiovascular disease risk occurring in people with insulin resistance. Citation Information: J Clin Invest. 2006;116(4):1081-1091. https://doi.org/10.1172/JCI26640. Short-term overfeeding blunts the central effects of fatty acids on food intake and glucose production. This acquired defect in nutrient sensing could contribute to the rapid onset of hyperphagia and insulin resistance in this model. Here we examined whether central inhibition of lipid oxidation is sufficient to restore the hypothalamic levels of long-chain fatty acyl-CoAs (LCFA-CoAs) and to normalize food intake and glucose homeostasis in overfed rats. To this end, we targeted the liver isoform of carnitine palmitoyltransferase-1 (encoded by the CPT1A gene) by infusing either a sequence-specific ribozyme against CPT1A or an isoform-selective inhibitor of CPT1A activity in the third cerebral ventricle or in the mediobasal hypothalamus (MBH). Inhibition of CPT1A activity normalized the hypothalamic levels of LCFA-CoAs and markedly inhibited feeding behavior and hepatic glucose fluxes in overfed rats. Thus central inhibition of lipid oxidation is sufficient to restore hypothalamic lipid sensing as well as glucose and energy homeostasis in this model and may be an effective approach to the treatment of diet-induced obesity and insulin resistance. Citation Information: J Clin Invest. 2006;116(4):1092-1101. https://doi.org/10.1172/JCI27177. The Helicobacter pylori neutrophil-activating protein (HP-NAP) is a virulence factor of H. pylori that stimulates in neutrophils high production of oxygen radicals and adhesion to endothelial cells. We report here that HP-NAP is a TLR2 agonist able to induce the expression of IL-12 and IL-23 by neutrophils and monocytes. Addition in culture of HP-NAP, as an immune modulator, to antigen-induced T cell lines resulted in a remarkable increase in the number of IFN-γ–producing T cells and decrease of IL-4–secreting cells, thus shifting the cytokine profile of antigen-activated human T cells from Th2 to a Th1 cytotoxic phenotype. We also found that in vivo HP-NAP elicited an antigen-specific Th1-polarized T cell response in the gastric mucosa of H. pylori–infected patients. These data indicate HP-NAP as an important factor of H. pylori able to elicit cells of the innate immune system to produce IL-12 and IL-23, and they suggest it as a new tool for promoting Th1 immune responses. Citation Information: J Clin Invest. 2006;116(4):1102-1109. https://doi.org/10.1172/JCI25604. The bile acid receptor farnesoid X receptor (FXR; NR1H4) is a central regulator of bile acid and lipid metabolism. We show here that FXR plays a key regulatory role in glucose homeostasis. FXR-null mice developed severe fatty liver and elevated circulating FFAs, which was associated with elevated serum glucose and impaired glucose and insulin tolerance. Their insulin resistance was confirmed by the hyperinsulinemic euglycemic clamp, which showed attenuated inhibition of hepatic glucose production by insulin and reduced peripheral glucose disposal. In FXR–/– skeletal muscle and liver, multiple steps in the insulin signaling pathway were markedly blunted. In skeletal muscle, which does not express FXR, triglyceride and FFA levels were increased, and we propose that their inhibitory effects account for insulin resistance in that tissue. In contrast to the results in FXR–/– mice, bile acid activation of FXR in WT mice repressed expression of gluconeogenic genes and decreased serum glucose. The absence of this repression in both FXR–/– and small heterodimer partner–null (SHP–/–) mice demonstrated that the previously described FXR-SHP nuclear receptor cascade also targets glucose metabolism. Taken together, our results identify a link between lipid and glucose metabolism mediated by the FXR-SHP cascade. Citation Information: J Clin Invest. 2006;116(4):1110-1116. https://doi.org/10.1172/JCI26092. We set out to confirm the long-held, but untested, assumption that dietary salt affects proximal reabsorption through reciprocal effects on the renin-angiotensin system in a way that facilitates salt homeostasis. Wistar rats were fed standard or high-salt diets for 7 days and then subjected to renal micropuncture for determination of single-nephron GFR (SNGFR) and proximal reabsorption. The tubuloglomerular feedback (TGF) system was used as a tool to manipulate SNGFR in order to distinguish primary changes in net proximal reabsorption (Jprox) from changes due to glomerulotubular balance. The influence of Ang II over Jprox was determined by the sensitivity of Jprox to the AT1 receptor antagonist, losartan. Plasma, whole kidneys, and fluid from midproximal tubules were assayed for Ang II content by radioimmunoassay. In rats on the standard diet, losartan reduced Jprox by 25% and reduced the maximum range of the TGF response by 50%. The high-salt diet suppressed plasma and whole-kidney Ang II levels. But the high-salt diet failed to reduce the impact of losartan on Jprox or the TGF response and actually caused tubular fluid Ang II content to increase. The persistent effect of Ang II on Jprox prevented a major rise in late proximal flow rate in response to the high-salt diet. These observations challenge the traditional model and indicate that the role of proximal tubular Ang II in salt-replete rats is to stabilize nephron function rather than to contribute to salt homeostasis. Citation Information: J Clin Invest. 2006;116(4):1117-1126. https://doi.org/10.1172/JCI26858. The immune system is capable of mounting robust responses against invading pathogens but refrains from attacking self. Many studies have focused on tolerance induction of Th1 cells, whose failure results in development of autoimmune diseases. However, the molecular mechanisms governing tolerance induction in Th2 cells and its relation to allergic responses remain unclear. Here we used both in vivo and in vitro protocols to demonstrate that Th2 cells either containing a mitogen and extracellular kinase kinase 1 (MEKK1) mutant or lacking JNK1 or the E3 ubiquitin ligase Itch cannot be tolerized. In a mouse allergic model, injection of high-dose tolerizing antigen failed to block the development of airway inflammation in Itch–/– mice. This study suggests that MEKK1-JNK signaling regulates Itch E3 ligase–mediated tolerogenic process in Th2 cells. These findings have therapeutic implications for allergic diseases.